Balmora has existed in some form since at least the late First Era, playing host to all three members of the Tribunal during the era's final days. 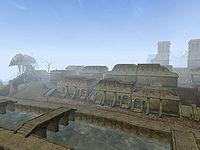 The town's most familiar incarnation, with Hlaalu-style houses, was constructed in the mid-Second Era when House Redoran contracted House Hlaalu to build the cities of Balmora and Suran for them. According to the contract, the cities were to be built in the Redoran style, but the Hlaalu nonetheless built it in their own style. Around 2E 583, Balmora was ruled by the Redoran councilor Eris Releth, until he was murdered by his own daughter in a family tragedy. Some members of House Hlaalu, most notably Councilor Rayveth, also lived and operated in the city. In addition, the Morag Tong maintained a safehouse in the city at the time. During the Imperial Simulacrum in the late Third Era, the village of Stoneforest was an active settlement, being ruled by Count Caskan. It had a rivalry with Karththor Dale. It was neighbored by several settlements, including Markgran Forest in the north, and Old Run in the east. By 3E 427, Balmora and Suran had been overtaken by House Hlaalu, and Balmora became their seat of power in Vvardenfell. At the time, business in the city was run by Nileno Dorvayn from the Hlaalu council house, but no Hlaalu councilors actually lived in Balmora. The town was destroyed during the Red Year by the eruption of Red Mountain. In a major relief effort out of Mournhold led by House Redoran, Balmora, along with certain other settlements around Vvardenfell, were rebuilt following the Red Year. The drink Balmora Blue is named after the city. It is a potent, contraband beverage made from moon sugar and other ingredients. 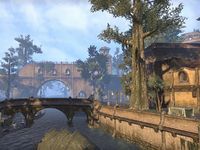 For game-specific information, see the Arena article on Stoneforest, the Morrowind articles on Balmora and Moonmoth Legion Fort, and the Elder Scrolls Online article on Balmora. This page was last modified on 22 March 2019, at 15:53.